Thanks to the Aquarelle collection, you will conjure up small works of art. The time has come to fully release your creative potential. Effective designs no longer require talent or a lot of experience. 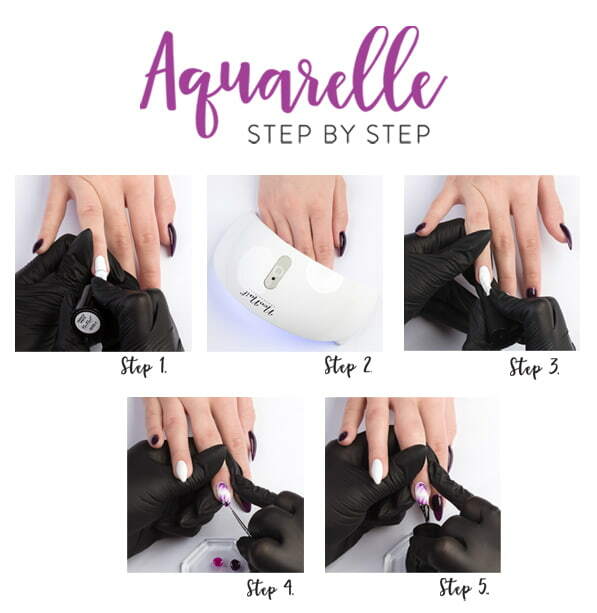 Hybrid Aquarelle base will make nail art easier. It is enough to apply a white base on a bright hybrid varnish and without curing go to styling. Only two movements of the brush with colorful Aquarelle varnish will create the most beautiful rose or colorful butterfly. Using Aquarelle base and varnish, creating original patterns on the nails becomes child's play. Both products do not require much practice. They will allow you to work easily and intuitively. Feel like a real master in decorating your nails. Surprise your friends with their own designs. It is thanks to a special base that Aquarelle varnishes spread so wonderfully. We recommend Aquarelle Base White when we want to have a more focused pattern, with stronger edges. It should only be used for white hybrid varnishes. This breakthrough collection consists of 6 transparent colors (Raspberry, Ruby, Purple, Violet, Navy, Emerald) and 6 shades with a more intense pigment (White, Pink, Lavender, Fuchsia, Blue, Black) and two bases: White and Clear color.